So it turns out I'm not as crazy as I thought, or at least not alone anyway! There are plenty of other people out their who treat their ducks to holidays. Ok, it's not a rubber duck (fur - eurgh), but Not Duck has been to the Antarctic - Respect. Duck Holiday has a number of ducks taking regular holidays! The Duck has been stalking celebrities. 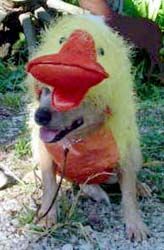 The Order of the Duck have a dog duck suit (or is that a duck dog suit??) That has been travelling around the states for some time now. Got a fake beard? Like to Travel? Then visit travel beard.